You’ve attracted potential customers to your company by interesting them with your services. You may have even impressed them with a long list of well-known clients and outstanding testimonials. But they still don’t really know how that much about the inner workings of your company and whether you can really do the job. This is where a good case study template can help. Create your own Case Study now for free! Your starting point to create and share beautiful case studies, without any design experience. 1. Capture interest. Good case studies tell a compelling story to potential clients of how your company rose to the occasion. Any project that your company has worked on can be a candidate for a case study, but the best ones showcase your company’s unique positioning or how you solved a particularly challenging problem for your client. This proves to potential clients that you have what it takes to perform well on their project as well. 2. Establish your brand as thought leaders. Built on researched conclusions from projects you’ve led, case studies allow you to showcase your expertise in your industry. If you regularly publish insightful and well-researched case studies, you can establish your company as thought leaders. 3. Focus future decision-making. When you look back on your case studies, you will find objections that your clients make to how you told that story. This will allow you to better align your value proposition with your customers’ needs. 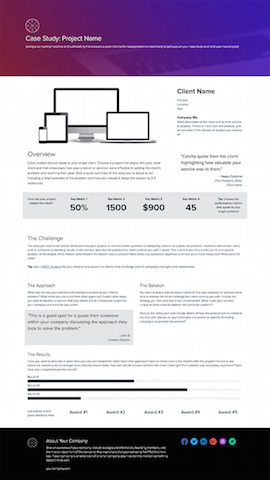 Here are some tips and tricks for filling in the Case Study template. The first thing to consider is who will be reading your case study. Messages and their delivery resonate differently, depending on who is on the receiving end. For example, a thirty-something software entrepreneur will measure success differently than a fifty-something CEO of a large corporation. Understanding your audience will help you tell your story in a way that will effectively speak to them. Quick Tip: Xtensio’s User Persona Template can help you identify your audience. It is always a good idea to reach out to your client, let them know you are thinking of using their project for a case study and get their permission. Not only is this good etiquette, but it also gives you a chance to follow up on their project (if you haven’t done so recently) and get some recent measurements of success and testimonials to add to your document. Look for metrics that can easily demonstrate success like sales and cost savings. Don’t forget to talk to your team and get their perspective on the project. You may also want to include some quotes from your internal stakeholders or project leads. Don’t forget! The best case studies not only tell a story but also contain some hard measurable metrics. Once you have identified the subject of your case study, you want to gather up as much background information as possible from your project files. Once you’ve compiled your facts, now it’s time to weave them into a story that will appeal to potential customers. Our template is organized into sections and modules designed to make your case study flow like a well-planned story and we’ve broken the template into three main sections: the snapshot, the body and the footer. This section is designed to give a quick overview of your case study and prompt readers to want to learn more. Think of it like a cover of a book or the short description on an online store. It should have enough information to grab a potential customer’s attention, but not so much that they will stop reading. Header: Use a short, catchy title to make your case study stand out from the crowd. A subheading is a great option if you want to add some additional information. You can use one of Xtensio’s backgrounds to add some color to your header, upload your own background image or use a solid color. Xtensio allows you to choose from a preset contemporary palette of colors or set a custom color through hex values. Client Snapshot: Add a little bit of information about your client here. Showcase a testimonial here – use one from the highest executive you worked with at the company. Key Metrics: We’ve added a place for some of your key numbers in an eye-grabbing, oversized font to highlight how you were able to help your client’s business. Use metrics that will appeal to your target audience. If you have a lot of metrics, only use the top three or four and leave the rest for later on. This section is the meat of your case study. Like any good story, it will have a beginning, a middle and an end. Classic western storytelling uses a pretty standard formula that includes a problem, the approach taken to solve it, the solution and the end result. The body of our Case Study template is divided into four key areas that align to these story elements. 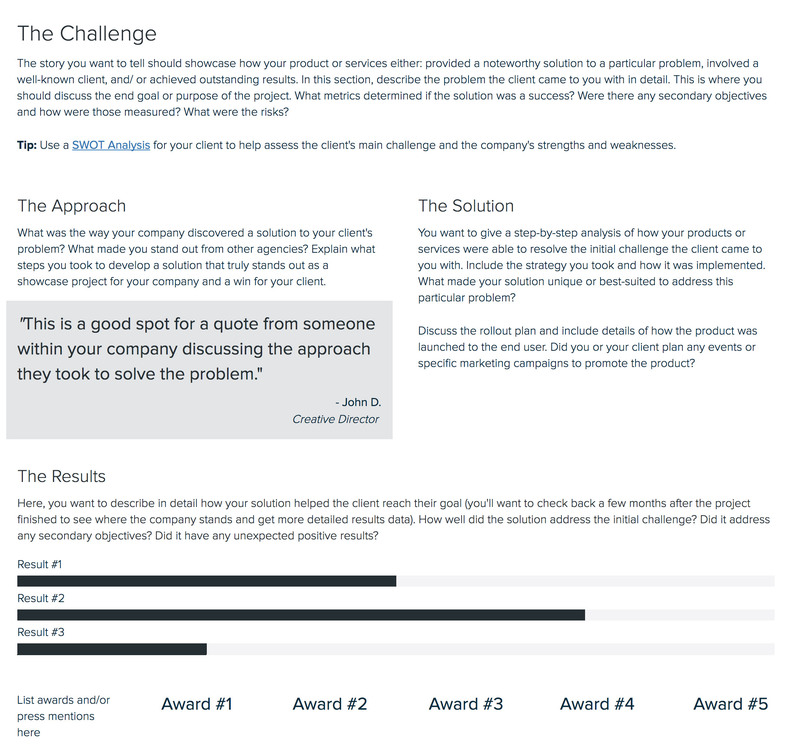 The Challenge: What is the problem the client wanted to solve? Why did they come to you and were there any other attempts at solutions before they came to you? What was the end goal they had in mind? This is your “before shot”. Use 2 – 3 paragraphs to describe the client’s problem in detail. Include metrics or any other hard data you may have available. The Approach: What was your company’s approach to solving this problem? Were you able to identify other issues that could be solved with the same solution? How was your company able to address the customer’s problem and what unique services, talents or skills were involved? Use a paragraph or two to describe the process you went through to reach a solution. The Solution: In a paragraph or two, fully describe the solution you came up with and any interesting steps taken to implement it. The Results: Cap off your case study with a great ending. Pull out all the stops and showcase how your customer’s business improved through their interaction with you. Use 2 – 3 paragraphs to detail the success of your project. Quickly add images, videos or charts with Xtensio modules. Accolades: Use this area to highlight press releases, awards, celebrity endorsements or any other notable mention that your project has received. Quick Tip: Use logos in the accolades section to add a visual boost. This area should just contain a short paragraph of who your company is, as well as contact information. This is handy if your case study becomes separated from your company information somehow. If your case study will be online, make sure to add the links to your website and social media handles, using our social media module. If you are planning to print your case study, don’t forget to spell out the name of your website and/or add a contact phone number and email address. Invite feedback and participation by your teammates by inviting them to collaborate on your folio. Simply add the email addresses they used when they signed up for Xtensio and they will be able to edit your case study in real time. Once you are satisfied with your case study, you can export a link to add to your website, share on your social media channels, use in presentations or send out in emails to potential clients. You can also download a pdf version that can be printed and shared.